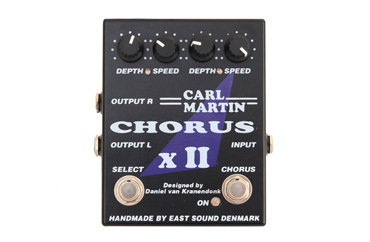 Carl Martin Chorus xII is a dual stereo chorus foot pedal. Designed by Canadian electronics wizard Daniel Van Kranendonk, the unit is the result of five years of careful research and development. It has two identical but independent sets of speed and depth controls. Each "chorus" has an LED indicator that lights up when in use and also flashes an indication of the speed setting. The Chorus xII has a stereo output via two quarter inch jacks. The "on" switch allows you to engage or bypass the chorus. The "select" switch allows you to switch between the two chorus settings mid song or mid set without having to get down on your knees alter the controls.